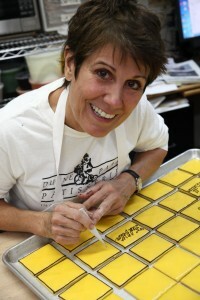 Madeline Lanciani is the owner of Duane Park Patisserie, a trusted vendor to Manhattan Fruitier for over two decades. Madeline is a world-renowned pâtissière whose artistic vision and mastery of French technique has produced decadent and delicious treats that we proudly feature in our gifts. Gilded-chocolate cake, walnut brownies and handmade dipped-white chocolate occasion cookies are just a few of the sublime creations she makes for us. 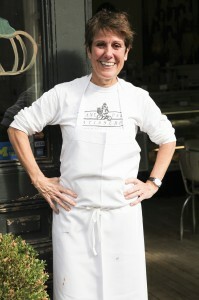 Madeline has had a storied career in the NYC food world, being a trailblazer and pioneer from the get-go. She was the first female chef ever hired at the Plaza Hotel – one gutsy young woman in a kitchen of 99 men. After much success in the culinary world, Madeline’s pioneering spirit brought her downtown to a quiet, industrial side street in what was then an unpolished Tribeca to raise her family and start a new career in the pastry world. Her business, Duane Park Patisserie, has flourished over the years and she is now considered among the finest pastry chefs in the country. While she has had many opportunities to expand beyond Tribeca, she has instead chosen to focus on perfecting her craft in her space on Duane Street. She is a vital part of Tribeca and NYC, nurturing her dedicated staff, clientele and neighbors with her astonishing desserts every day. We at Manhattan Fruitier value our long time relationship with Madeline and the mountains of exquisite desserts that have graced our gifts for so many years. We thought it was about time to get to know her better and introduce her to our Manhattan Fruitier community. Last week, Madeline graciously opened her door to us and invited us in for a behind the scenes tour of her busy, bustling patisserie while she shared her thoughts on her history and business. Working on a Halloween cake. The client requested it look like black lacquer. How many pastries, desserts and treats do you make on any given day? Today we are doing about 3000. That is a pretty typical day in October with lots of Autumn events on the calendar. Do you bake any bread? No, we are a pastry shop. A patisserie. In France, and in a lot of places in Europe, you get your pastry in a patisserie and your bread in a boulangerie. The only “bread” we bake are croissants for the morning. Most patisseries offer croissants and other small breakfast items they really consider breakfast pastries–not breads. What do you see as the next trend in pastry? Something that hasn’t peaked yet: the continued popularity of shops where everything is specialized. It started a while ago with donut shops. And that’s caught on across the country but all the other little specialty shops – just cookies, just wedding cakes, just cupcakes, just cronuts, its spreading all throughout the United States. I think a lot of customers have the erroneous perception that if you go to a shop that just does one thing they’re going to do it better than one that has a variety of offerings. They’re going to think that ‘oh, they only do that one thing; they must be experts at it.’ Which is not necessarily the case. In fact, I think you can run the risk of having your quality slip because of the monotony. I get why they do it – hoping their one product will catch on and can be franchised for lots of money. You don’t get rich having one bakery… So what’s the next trend? Americans are really into food fads. I don’t know, last year people thought it was cake pops, but that actually has fizzled out, because when people started to make them they realized that they are so labor intensive! They’re cute as can be but what can you sell them for when you have to spend five hours on twelve cake pops?! 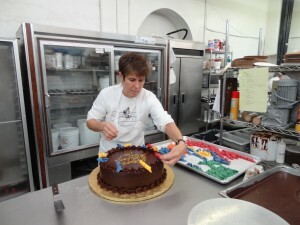 Finishing touches on a birthday cake for the V.P. of a top catering company. I think we’re a very unique place. In this age of specialty shops, we have, for almost 25 years, just stuck to a little of everything. A real “old-fashioned pastry shop” where we keep the ideas fresh, where you’ll find some cakes, some cookies, some tarts, and custom desserts, often reflecting the current season or holiday. We make everything to order. We don’t have an inventory of refrigerated or shelf items, preferring to bake fresh for our clients. Everything is made fresh daily? Yes. Whether it’s one person ordering for a dinner party or an event for 3000 people. What is the dessert you like making the most? The one I’m working on at the moment! I know that sounds stupid but it’s true. I’m into the thing at the moment. Although there are certain things more fun to work on than others. When you get home at night what do you make for yourself and your family? I came from immigrant parents and we always had dinner together. It was the rule of the house. You were home for dinner. Period. We didn’t know it at the time but it was kind of cool. So I adopted the same rules and regs for my kids too. When they were little, what I cooked was anything I could get on the table in twenty minutes—usually some kind of pasta or rice with something from the fridge. If I could make it in twenty minutes, that was that. Nowadays my daughter lives in California and my son works for a P.R. firm that keeps him busy with events at night. So I leave stuff in the refrigerator for him to eat when he can. This extra time has allowed me to be more adventurous in my cooking. It’s very satisfying. It’s a very zen-y thing for me to do. Dipping Manhattan Fruitier’s occasion cookies in tinted white chocolate. 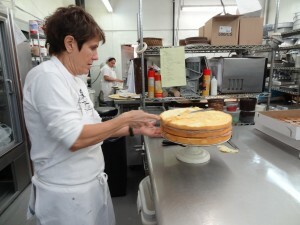 What’s a great day for Duane Park Patisserie? One of the greatest days of the year is the annual springtime event “Taste of Tribeca.” It’s a fundraising event we started 18 years ago with all the chefs, food people and the parents of our only school at the time. The proceeds went to the PTA of our school PS 234, so that we could pay for a part-time art teacher and a part-time gym teacher as those aren’t paid for by the city. It’s turned into such a big event. It’s in May and the sun is usually shining, and the doors are open, and everyone is happy because they’re eating food. You’ve been working and living here in Tribeca for many years. How has your clientele and neighborhood changed? Madeline inspecting Manhattan Fruitier’s batch of walnut brownies. We hear you do a lot for Halloween. Oh, my God, Halloween. It’s coming…Sometimes we take the little ends we cut off Manhattan Fruitier’s brownies and wrap those in cellophane and give those to our Trick-or-Treaters. It’s gotten so big now though. Tribeca is such a family-oriented community. On Halloween all the stores and restaurants give away treats. Everyone gets dressed up—even the parents, and stores and restaurants give treats like it’s an old-fashioned town. 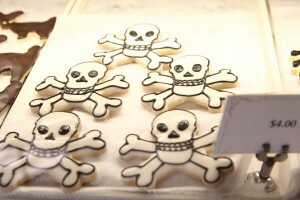 Scary skeleton cookies for sale at Duane Park Patisserie. Last year was cancelled because of Hurricane Sandy, but the year before that, we gave 3,000 away and then unfortunately we had to close the door. Which do you prefer more, the retail or the wholesale side of your business? I have both on purpose. Retail, and this location, is challenging, but having the wholesale helps me maintain the retail. I stay with the retail for several reasons – It’s my way to connect with the neighborhood. Back in the old days no retail stores were allowed on side streets in Tribeca because of zoning. You could only have a retail space if you were a manufacturer. My retail patisserie actually grew out of the overages and the cancelled orders of my wholesale clients. Neighbors would come by to see what we had to sell. I had one table and an old cash register and that’s how my retail started. 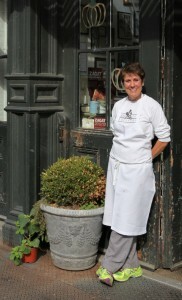 Madeline Lanciani outside her busy patisserie and café, Duane Park Patisserie. It allows for your brand to be visible. That’s exactly right. It’s very good for visibility and marketing and it still is a place to sell the overages of the cancelled orders and it prevents me from getting bored. Some of our wholesale clients are caterers so we do get varied menus a lot. But the volume work can get a little monotonous. The retail with individual orders, specialty cakes, cookies and desserts are the kind of stuff that satisfies my creative juices. Like these two projects I’m working on now. 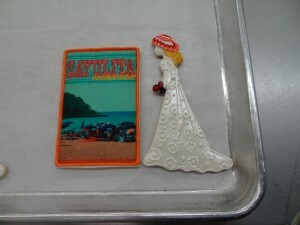 One of the many custom cookie designs Lanciani creates. 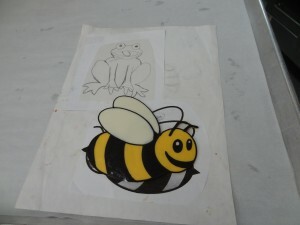 The other will be a bumblebee cake. Design for a custom cake. 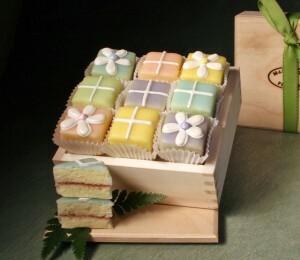 We have also launched a new petits fours project called Message in a Box. It sounds like what it is: 15 petits fours spelling out a greeting. We have a lot of ideas to come but we have several posted on our website. Here is our custom box of petits fours from Duane Park Patisserie. What would you tell someone who is interested in opening a bakery or a patisserie? Why? What’s your goal? Is your goal to make money? Is your goal to develop a product and business model that will end up making you money? Or is your goal to satisfy your love and your need to bake and create? Think about that first. Then you can figure out which way to go. Either way, you have to be able to work for very long hours, and very physical work, with not much money, at least at the beginning. 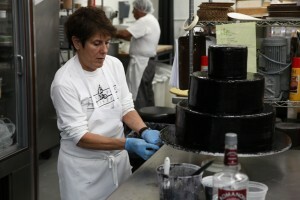 Preparing to frost a triple layer classic buttercream cake. You were the first female chef to be hired at the Plaza Hotel. What was that like? Ha. I don’t think you have enough battery left on your phone for that question. I’ll tell you it was one of the best experiences a person could ever have. I was there for two and a half years. I had some fabulous teachers. They paid me to learn. And I couldn’t have had a better education. My degree was in music. I was a singer and I couldn’t afford to enroll in the Culinary Institute so I was fortunate to have that experience. But it was very, very difficult in the beginning. I had to work for no pay for four months before they hired me because they had to be sure that I wasn’t going to upset the kitchen. And when I got there it was 99 men and me, and I weighed 15 pounds less than I weigh now. And some of the men embraced me fabulously. Some of the men were indifferent and some were really threatened and awful and they did things to me that they would be in jail for today. Hazing is not even the right word. Criminal. But I didn’t open my mouth. Not because I was afraid to be fired. It was a different world. It was a tough world. Especially cooking in the kitchen. And you needed to be able to survive. It was kind of like being in the army. If you can’t survive boot camp you’re not going to live on the field. You’ll get killed. So I treated my training there, part of my training there, especially the adversarial part, as boot camp. And I never cried — I never let them see me cry. Who’s had the biggest impact on your professional career? Obviously my parents. But I do have an anecdote about a person who had the biggest impact on my professional life, the actor and director Joel Grey. Before I started my career in pastry I was a professional singer and I got a job as a Kit Kat girl in Cabaret that he was starring and directing in. We had a costume check a few minutes before curtain so we all lined up. I had fishnet stockings on and there was a tiny rip so two holes had become one. Well, Mr. Grey noticed. He said “go see the wardrobe mistress; you can’t go out like that! Everybody pays good money to come and see this show and they don’t deserve shabby costumes.” I was a nobody, a chorus person. My take away from that is: everybody deserves every part of their experience to be absolutely correct and the best. And I have lived by that. Nothing goes out of here unless it is exactly right. The person buying one cookie, even if it’s tiny and costs 50 cents deserves it to be the best 50 cent cookie we produce. 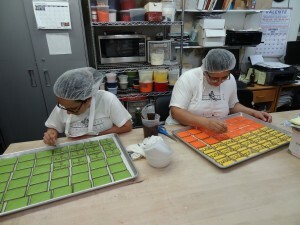 A steady hand and excellent handwriting is a must for Madeline’s team who work on our occasion cookies. Any funny Duane Park Patisserie stories you can share? Oh so many. There was the one day this couple came in from London and were so fascinated by our scones. They came in the morning and the woman thought they were the best scones she had ever eaten so she brought her husband back. He thought so too and they ended up coming back four times that day and eating scones. And the time we made 10,000 cupcakes for Columbia University. We had baked all night for this event. We rented a special truck with racks and loaded them in the truck and away we went but the straps didn’t hold the racks and they all toppled down like dominoes. The cupcakes were ruined. We had six hours left until the event so we drove back to the bakery and started over. We had no time to frost them so we set up a frosting station at the event and did them to order. Everyone thought it was so clever and novel. At the time we didn’t think this would be a funny story at all but I can now look back and laugh! Growing a business and raising a family are each challenging enough on their own. How did you manage doing both at the same time? It’s all a matter of constant compromise. Re-balancing, re-assessing, re-working. There is no magic formula as far as I have experienced. A parent doesn’t get any “do-overs.” I decided that raising my children was my primary job. My secondary job, a.k.a. my career, was absolutely necessary for survival since for most of my kids’ lives I was a single mom. I needed to keep growing my business in order to provide for me and my children, but at the same time I had to control that growth and opportunities that came my way so I could keep my job as mom in balance with my job as baker/pastry chef. Some decisions were difficult: turning down orders and opportunities is generally not a good business plan, but I did just that if I felt the end result impacted my parental duties. I had much anxiety about every decision. My old friend, Mario Batali, told me 15 years ago to hire a PR person to promote my business. I knew that building myself into a brand was going to mean building another business. I decided that I had no time for a third enterprise. Maybe this was a mistake, but the fact that I was able to go to almost ALL of my kids soccer, basketball, baseball and lacrosse games, plays, recitals, teacher conferences, etc. and be home for them to cook and eat together was in the long run more important to me and them than developing myself into a celebrity chef. Do I have regrets? As the song goes “…a few, but then again, too few to mention.” I am most proud of my #1 products, who are now 24 and 27. Madeline was the winning competitor on a thrilling episode of The Food Network’s cooking competition show, Chopped. Speaking of being a celebrity chef, we were so excited for you when you took home the big prize on Chopped a few months ago. Tell us about that experience. I’ve been in pastry for years but love to cook. My dream job to this day is to cook on the line. It’s not feasible when you have a business and one of the reasons why there are so few working female chefs. Night-time work is not good if you want to raise a family. So, I took on Chopped to see if I could still do it. It was challenging, but I’ve always been a competitive person. My mother would enter us into coloring contests when we were little. Damn it, I was gonna win and I did win! Coloring contests, essay writing contests, whatever. What advice do you have for a young chef just starting out? Be prepared to work harder than you ever, ever imagined. This entry was posted in Maker of The Month, New Products, Vendors. Bookmark the permalink. Thanks, we think so too. She’s such and inspiration to all of us. Terrific story. She’s got great kids and great pasteries to prove it. I knew Madeline in college. She made spectacular treats back then. Good to have an update. Now I need to visit Trabeca!